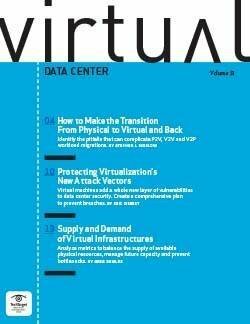 Selecting a new data center server is always a crucial call, but virtualization adds some wrinkles that administrators must be aware of. 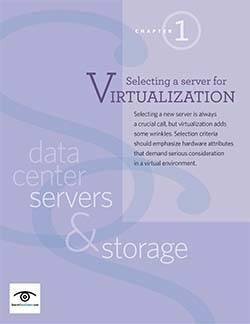 In this e-book, learn more about the criteria for selecting a server for virtualization, and how to ensure that your server will meet your virtualization and storage needs. Plus, learn about hardware attributes that demand serious consideration in a virtual environment. Once your hypervisor is installed, what's next? 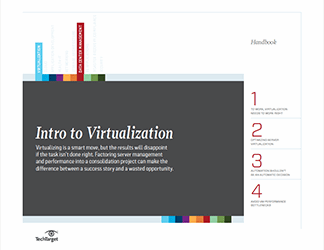 You need to implement virtualization that's actually going to benefit your organization. Read tips in this e-book to help you get the most out of your hardware investment by monitoring virtual servers. With Fibre Channel, iSCSI and even prepackaged storage-plus-SAN solutions available, figuring out which makes sense for your particular environment can be tricky. Learn provisioning tactics that can help organizations make the most of their storage in a virtual data center. With a bit of planning, a specific tiering-out of your system priorities and a dash of virtualization, you can breathe new life into your old servers -- even as you bring in replacements with all of their powerful new capabilities. Read this e-book to learn about making the most of unused storage and server hardware.